The Semi-Annual State New York State Board Meeting will take place at 10 AM on Saturday, November 3rd at the Melville Marriott Hotel at 1350 Walt Whitman Road, Melville, NY. A Testimonial Dinner will be held that evening at 7 pm honoring Vic Vogel President of the New York State AOH. In conjunction with this will be the presentation of the 2018 NYS AOH Burns-Hayes Award to William "Bill" Powers of the AOH Thomas Carroll Division Buffalo, NY. The winner of the NYS Arnie Nagelhout Charities and Missions award will be announced at the dinner. Tickets are $125. Dinner registration forms can be found at www.nyaoh.com. For reservations contact 1-631-423-1600. For more complete information contact William Butler, Event Chair, at wbutler547@apl.com or at 1-631-384-3961. Thanks to all who participted in the Life Chain on Respect Life Sunday, October7th on Rte 211 East in Middletown. Hibernians are a Pro Life organization, and we demonstrate this by our participation in events such as the Life Chain. Thanks also goes out to members who helped out and supported Irish Day on Sunday, October 21 at the Our Lady of Lourdes # 5890 Knights of Columbus Hall in Washingtonville. This event is sponsored by the Mid Hudson St. Patrick's Day Parade Committee. The music, dancing, food and camaraderie was great. Hope to see you back next year. The Orange County AOH Communion Breakfast was held at the National Shrine to Our Lady of Mount Carmel in Middletown on Sunday, October 28. Thanks again to the Brothers and their guests as well to the LAOH who joined AOH Divisions in the celebration of the Mass celebrated by 90 years of age Carmelite Fr. Paul Feely. Special thanks to AOH Orange County President Edmond Burke and past president Ronald Joseph Heppes for their efforts towards making this happen. AOH Division 2 President Bill Kirnan and AOH Division 1 Brother George Anderson read the Mass readings. Maureen Morse read the Responsorial Prayer. Those in attendance - aided by Maureen - responded in the language of the Irish. Prior ro the Mass AOH Division 4 held a Commorative Prayer Ceremony outside St. Brendan's Chapel to honor its deceased Carmelite chaplains. Honored were Fr. Matthias DeLauriers, Fr. Alfred Isaacson, Fr. Jack Logan, and Fr. Bob Greco. Divisions 1 and 2 joined us in the prayer service. Bagpiper Terence Mullen of Division 4 played the pipes as he led The Brothers from the three county Divisions into the chapel. Division 4 Brothers Raymond Patterson and Gene Burns carried the American and Irish flags as we processed into the Chapel. Dan Dennehy AOH National Director was the featured guest speaker. Dan spoke to a number of topics among them Immigration and the undocumented Irish, the McBride Principles, the retirement possibilities of Irish Americans to Ireland, current events in Ireland as well as an overview of Irish History since the 1970s. He stated tha only 30 of our 50 states have adopted the McBride Principles, and that it is a good idea to contact our legislative representatives especially right after the election in order to get them to address matters that effect the Irish. In regard to recruitment of new members, he suggested that we contact the deans of students at area colleges to let them know about speakers and events that the students may be interested in learning about. Dan has been very active at the local, state and national levels in immigration matters. His wife is also active through the Emerald Isle Immigration Center in New York City. Dan is a member of AOH 18 in Peekskill, NY. If you have questions you would like to ask him, he has graciously givien his phone number and email address which are 914-588-2710 and Dandennehy@hotmail.com. Welcome to AOH Division 4 to our newest member Brian Newberry who was installed as a Hibernian Brother at the October meeting. He is a Scotchtown resident and a New York City Police Officer. In all liklihood we will be installing a new member at the November 2nd meeting. Hopefully you can make it and help us welcome a new Brother. A slate of officer candidates has been presented and will be voted on for 2019. Installation of the newly elected officers will take place at the December 7th meeting. The Fr. Emmanuel Hourihan O.Carm.AOH Division 4 is an Irish Catholic men's organization. In order to be considered for membership you must be a practicing Catholic and be able to claim a bit of Irish ancestry through either parent. Our members belong to several parishes throughout Orange county. During the month of September we recruited for new members via parish bulletins. We will renew efforts to do so in the upcoming year especially during the months preceding St. Patrick's Day. The motto of our fraternal organization is Friendship, Unity and Christian Charity. Recruiting new members via family , friends coworkers and fellow parishoners are the ways we have recruited in the past. Recently though some of our newest members have come to us from the National and New York State AOH organizer Kevin Cummings of AOH Division 2. Any ideas Brothers have on how to attract new members are most appreciated. The upcoming holidays of Thanksgiving, Christmas and New Years are good times to reach out to a prospective member since there are more activities and conversations going on in our lives both at home, in the community and at work.teptember. I plan on doing so again during the 2019. AOH Joseph Duelk Jr. Division1 Monroe is in the process of recruiting Catholic young men ages 8-15 to form an AOH Junior Boy's Division. This Division is called the Louis Allen Division. AOH Division 1 President Thomas Flynn and Orange County Board President Thomas McDonald have contacted John S. Burke CHS to attract young men attending there to consider joining an AOH Junior Boy's Division. If you have family members or know someone who would be likely and deserving candidates, please have them contact me and I will obtain the pertinent information and put them in contact with Brother Tom Flynn and /or Brother Tom McDonald. 1st Lieutenant Louis Allen of the 42nd Infantry Division of NY Army National Guard was mortally wounded by a claymore mine in Iraq and died on June 8, 2005. He was a Physics and Earth Science teacher at George S. Baker High School in Tuxedo. He lived with his wife Barbara and their 4 boys in Milford, Pennsylvania. His Gold Star parents are Bob and Vivian Allen of Chester. Bob is an AOH Division 1 member. Lieutenant Louis Allen's death and the death of a fellow officer are tragic in that they were caused by the cowardly actions of a soldier in his command. That soldier who was accused and essentially admitted to his cowardly act, recently died in the state of Florida. Remember to keep in your prayers our deceased Chaplains, Fr. Robert Greco, Fr. Jack Logan and Fr. James Matthias DesLauriers and AOH Division Brothers who have passed away especially Brothers Michael Garay and Dennis Simmons. Keep Michaela Cummings (Mike's wife), Brother Tom Cavanaugh, Frank McDonald and Anne Greehy wife of Brother John Greehy of AOH Division 2 in your prayers. Keep all our Brothers and their families in your prayers. Orange County News The next Orange County AOH Board meeting will be held at Fr. Donald J. Whalen AOH Division 2 Hall in Cornwall, NY on Sunday, September 9th at 2pm. All members in good standing are welcome! AOH Orange County Picnic will be held on Saturday, September 22 beginning 1pm at the Fr. Donald J.Whalen AOH Division 2 Hall on Hibernian Way in Cornwall NY. AOH Division 4 will be sponsoring the AOH Orange County Communion Mass and Breakfast to take place on Sunday, October 28th at the National Shrine to Our Lady of Mount Carmel on Waywayanda Avenue in Middletown. The Mass is 9:30am at St. Brendan's Chapel followed by the breakfast at the Shrine. Division 4 Brothers will convene prior to the Mass at 9:00am for a prayer service at the Carmelite Cemetery on grounds of the Shrine to honor our deceased Carmelite chaplains. Irish Day/Halfway to St. Patrick's Day will take place on Sunday, October 21st at the Knights of Columbus Hall in Washingtonville from 1PM to 7PM. Fr. Emmanuel Hourihan O. Carm Ancient Order Hibernians (AOH) Division 4 is an Irish Catholic men’s organization. Brothers we are in search of new members. In order to be eligible to become a member one must be a practicing Catholic and claim a bit of Irish heritage through either parent. Our members come from several parishes throughout Orange County. During the month of September we will be recruitung for new members via ads in the bulletins of several parishes in Orange County. The Ancient Order of Hibernians is a fraternal organization whose motto is Friendship, Unity and Christian Charity. It has existed in this country since 1836. The AOH is recognized as a staunch defender of the Catholic religion. Contact Kevin Dooner at 845-342-8892 if you are interested in joining our organization and would like further information. AOH Division 4's next meeting is First Friday, May 4th, 7:30pm at the Dikeman Engine & Hose Company in Goshen. New York State AOH News: The Semi-Annual NY State AOH State Board Meeting will take place 10:00 AM on Saturday, May 5th at the Shamrock House at 145 East Durham, NY. Thanks to all brothers who attended St. Patrick's Day Celebrations and to those volunteering their time and/or marching in the Mid Hudson and New York City parades. The weather cooperated for both parades. Remember next year's NY City's parade also will be on a Saturday again. Mark your calendars. Thanks to Ed Burke, AOH Orange County President for keeping all Divisions apprised of all events and well informed. Brothers we must remember to stay committed to celebrating our Irish heritage throughout the year too. Listed below for another month are those recognized and honored in March for their numerous contributions to the Irish community. AOH Joseph Duelk Jr. Division 1 is in the process of recruiting Catholic young men ages 8-15 to form an AOH Junior Boy’s Division. This Division will be called the Louis Allen Division. AOH Division 1 President Thomas Flynn and Orange County Board President Thomas McDonald have contacted John S. Burke CHS to attract young men attending there to consider joining an AOH Junior Boy's Division. If you have family members or know someone who would be likely and deserving candidates, please have them contact me and I will obtain the pertinent information and put them in contact with Brother Tom Flynn and /or Brother Tom McDonald. Reminder: Dues Payment for 2018 is here Brothers. Remember to keep in your prayers our deceased Chaplains, Fr. Robert Greco, Fr. Jack Logan and Fr. James Matthias DesLauriers and AOH Division Brothers who have passed away especially Brothers Michael Garay and Dennis Simmons. Keep Michaela Cummings (Mike's wife), Brother Tom Cavanaugh, Tom McDonald's brother Frank and Anne Greehy wife of Brother John Greehy of AOH Division 2 in your prayers. Keep all our Brothers and their families in your prayers. AOH Division 4's next meeting is Friday, March 9th 7:30pm at the Dikeman Engine & Hose Company in Goshen. *A brief FEHOC meeting after the regular Division 4 meeting will be held in order inform the Brothers of any and all recent or expected changes that may need to occur regarding the corporation. The AOH National is also asking all members who received AOH Return labels with their name and address to please consider making a donation in accordance with the directions given with their labels. Go to Upcoming Events for Irish Celebrations in March 2018! Congratulations to AOH Division 4 Brother Brian Strommer who will represent the Division in this year's Mid Hudson's St. Patrick's Day Parade held on Sunday March 11th in Goshen. Brian's brother Kevin is also an Aide in this year's parade. They both are nephews of Brother Ron Heppes and his wife Kay. Brian traces his Irish roots to counties Sligo, Mayo, and Down. He was born in Goshen, New York in July 1963 to Gerard F. Strommer and Ann L. Strommer nee Sweeney. Upon graduating from Washingtonville High school in 1981, Brian enlisted in the United States Navy. Brian served his country for over 22 years in the USN from May 1982 until his retirement in August 2004. Brian enjoyed a successful career in the US Navy, traveling the world, receiving dozens of citations and commendations, as well as dozens of medals while serving over 13 years at sea on a variety of combatant ships. He retired as a Master Chief Petty Officer in 2004. Prior to retirement, Brian returned to Washingtonville, New York and married Sharon Hinchey in February 2001.They settled in Washingtonville and have four children, Brandy Leigh, Brian Thomas II, Owen Michael, and Keira Ann. Upon retirement, Brian began a career with the Federal Bureau of Investigation, where he continues to work today. Mid-Hudson St. Patrick's Day Parade Committee held its Grand Marshal and Aides Installation Ceremony at the AOH Division1Hibernian Hall on Sunday, December 3rd. Congratulations to Maureen Morse, the 2018 Grand Marshal of the Mid-Hudson St. Patrick's Day Parade and her aides. The 2017 Grand Marshal, George Anderson, performed a commendable job emceeing the event. Maureen's Aides are as follows: John McCabe, Joseph Duelk Jr. AOH Division 1 Monroe, Chris Sherwood, Fr. Donald J.Whalen AOH Division 2 Cornwall, Brian Strommer, Fr. Emmanuel Hourihan AOH Division 4, Kevin Strommer, Knights of Columbus Our Lady of Lourdes Washingtonville, David Morse, Irish Heritage Festival Committee, Eileen McAllister Walsh, LAOH 5 Mary of the Gael Monroe, Aiden Maloney, St. Brendan's GAA Greenwood Lake, James O'Donnell, Mid-Hudson St. Patrick's Day Parade Committee Aide at Large Goshen, Floyd DeAngelo, Greenwood Lake Cultural Society. Maureen was born and raised in Troy, NY. Her parents were James F. McGovern of Troy and May Kathleen Coggins of Easkey, Co. Sligo, Ireland. Her only sibling, Eileen Anna McGovern Izzo, passed away a few years ago. She attended St. Patrick's School, Catholic Central High School and AIB - The American Institute of Banking. She also holds a Certificate of Irish Studies from Tara Circle, Yonkers, NY. Maureen and Fred, her husband of 57 years, live in Chester, NY. They have two children, Michael and David and three grandchildren, Lyndsy, Kiana and Colin. Maureen is a founding member of the Irish Heritage Festival and a charter member of Ladies Ancient Order of Hibernians Division 4, Middletown, NY. She held several offices including her favorite, Irish Historian. She was also Freedom for All Ireland Chair on the LAOH Orange County Board. Maureen has been an active member of the MHSPPC for more than 20 years as a delegate from the Irish Heritage Festival Committee or the Ladies Ancient Order of Hibernians Division 4. She has consistently served and chaired several committees, and has performed many other jobs necessary to make our Parade a success. Currently, Maureen is Financial Secretary, Journal Chair, and Historian of the Mid-Hudson St. Patrick's Parade Committee. Maureen has given Irish Language workshops throughout Orange County at various venues,including Mt St. Mary College, elementary schools, and libraries. We are very proud to have Maureen as our 42nd Grand Marshal. AOH Orange County Board News. Keith P. Reynolds has been selected by the County Board to be the 2018 New York City Aide to the Grand Marshal Loretta Brennan Glucksman. Congratulations Keith for the honor bestowed upon you. Keith is our current NYS AOH Regional Director. Here is his biography as posted on the AOH County Board site. Keith P. Reynolds of Middletown, N.Y. was born in the Bronx and raised in Congers, New York. Keith is the eldest of two brothers born to Kevin and Holly Reynolds. He is married to Janice (nee Boyle) Reynolds and has 3 children Jessica, Matthew and Keira. Keith traces his Irish heritage through his grandparents who emigrated from Counties Meath and Cavan. He attended SUNY Rockland and served in the United States Marine Corps Reserves before being hired as a Police Officer with the Greenwood Lake Police Department in 1988. In 1991 Keith graduated the F.B.I. Firearms Instructors School at Camp Smith. He quickly became the department's Senior Firearms and Training Officer. Keith served as the department's Field Intelligence Officer and Dive Team Leader on the department's Dive Rescue Team. He was promoted to the ranks of Corporal in 2001 and Sergeant in 2005. Keith received numerous commendations and awards throughout his police career, including the Medal of Honor. After retiring from the Greenwood Lake Police Department in 2012, he joined the Town of Deerpark Police Department and served as the Firearms and Training Officer until 2017.Keith is a proud member and Past President of the AOH Joseph Duelk Jr. Division 1 in Monroe, New York. He is the past New York State AOH Organizer and District 8 Director. He is a member of the Pine Bush Knights of Columbus. Keith also served as a past Director of the Mid-Hudson St. Patrick's Day Parade Committee. He is also a former Bass Drummer with the Orange County AOH Division 1 Pipes and Drums. Keith served his community as 1st Lieutenant with the Pine Island Volunteer Fire Department until 2009. He is also a member of the Police Emerald Society of the Hudson Valley. The New York City St. Patrick's Day Parade Committee has selected Irish America Hall of Fame inductee Loretta Brennan Glucksman to lead the 2018 New York City St. Patrick’s Day Parade as the 257th grand marshal. Glucksman, who has long been a champion of Irish causes and devoted Irish American philanthropist, is the chairman emeritus of the American Ireland Fund and co-founder of Glucksman Ireland House at New York University. She will be only the fifth woman in the parade’s history to serve as Grand Marshal. Reminder: Dues Payment for 2018 is here Brothers. Go to Upcoming Events for Irish Celebrations in March 2018! AOH Division 4's next meeting is Friday, December 15, 7:30pm at the Dikeman Engine & Hose Company in Goshen. The Advent season is here and Christmas and New Year's will so quickly be upon us. Let us not forget what the holy days are all about as we get so busy shopping and celebrating. Remember family, friends and the Brothers who are no longer with us in your thoughts and prayers. Pray for those who need our prayers. Keep safe and to you and yours a Blessed Christmas and a Happy and Holy New Year. Election of AOH Emmanuel Hourihan Division 4 officers for the year 2018 will take place at the Division 4 meeting on Friday, December 15. A slate of officers was presented by nominating committee chairman Ron Heppes. A Christmas get together and meal will take place immediately after the meeting's conclusion thanks very much to Bob Heppes. The AOH National is asking AOH Divisions to identify for them our members who are veterans. The National would like to have your veteran status reflected on AOH membership cards for the first time in the coming year. Please contact Brother Ed Burke at eburke@hvc.rr.com informing him of your veteran status: branch and years of service. AOH Board News. Keith P. Reynolds has been selected by the County Board to be the 2018 New York City Aide to the Grand Marshal Loretta Brennan Glucksman. Congratulations Keith for the honor bestowed upon you. Keith is our current NYS AOH Regional Director. Here is his biography as posted on the AOH County Board site. Keith P. Reynolds of Middletown, N.Y. was born in the Bronx and raised in Congers, New York. Keith is the eldest of two brothers born to Kevin and Holly Reynolds. He is married to Janice (nee Boyle) Reynolds and has 3 children Jessica, Matthew and Keira. Keith traces his Irish heritage through his grandparents who emigrated from Counties Meath and Cavan. He attended SUNY Rockland and served in the United States Marine Corps Reserves before being hired as a Police Officer with the Greenwood Lake Police Department in 1988. In 1991 Keith graduated the F.B.I. Firearms Instructors School at Camp Smith. He quickly became the department's Senior Firearms and Training Officer. Keith served as the department's Field Intelligence Officer and Dive Team Leader on the department's Dive Rescue Team. He was promoted to the ranks of Corporal in 2001 and Sergeant in 2005. Remember to keep in your prayers our deceased Chaplains, Fr. Robert Greco, Fr. Jack Logan and Fr. James Matthias DesLauriers and AOH Division Brothers who have passed away especially Brothers Michael Garay and Dennis Simmons. Keep Michaela Cummings (Mike's wife), Brother Tom Cavanaugh, Tom McDonald's brother Frank and Mary Burdo, Pat Lahiff's cousin in your prayers. Keep all our Brothers and their families in your prayers. Reminder: Dues Payment for 2018 is coming up Brothers. A Blessed Christmas and Holy and Happy New Year to You and Yours! Cead Mile Failte! A Hundred Thousand Welcomes! Don't forget to check out the Upcoming Events! Our next meeting will be on Friday, February 3rd, 7:30pm at the Dikeman Engine & Hose Company in Goshen. President - Kevin Dooner, Vice-Pres. - Conor Gillis, Financial Secretary - Edmund Burke, Recording Secretary - Thomas B. Quinn, Treasurer - Michael Garay - Chairman, Standing Committee, James O'Malley, Marshal - Robert Heppes, Sentinel - Ronald Heppes. Remember family, friends and the Brothers who are no longer with us in your thoughts and prayers. Pray for those who need our prayers. Keep safe and to you and yours a Happy and Holy New Year. New Year's Resolution: Every Brother recruits a new member! The AOH Division 4 Officers shown above will all be sworn in at the January meeting. Congratulations to those Brothers selected to represent the AOH Fr. Emmanuel Hourihan Division 4 this year! 1st Lieutenant Louis Allen of the 42nd Infantry Division of NY Army National Guard was mortally wounded by a claymore mine in Iraq and died on June 8, 2005. He was a Physics and Earth Science teacher at George S. Baker High School in Tuxedo. He lived with his wife Barbara and their 4 boys in Milford, Pennsylvania. His Gold Star parents are Bob and Vivian Allen of Chester. Bob is an AOH Division 1 member. Lieutenant Louis Allen's death and the death of a fellow officer are tragic in that they were caused by the cowardly actions of a soldier in his command. Right to Life March in Washington D.C. will take place on Friday, January 27. "This year's theme is "The Power of One". Every year over a million babies to live and change the world each year. The theme encourages us to start with our families and neighborhoods in a collective effort that will change hearts and minds, and save lives to build a culture of life." The aforementioned appeared in the January 2017 NYAOH State Newsletter. At the Mid-Hudson St. Patrick's Day Parade Committee meeting held on Tuesday, November 15th. Committee members voted AOH Division1's George Anderson to serve as the Grand Marshal in the 2017 Mid-Hudson St. Patrick's Day Parade to be held in Goshen. Congratulations to George from AOH Division 4! All nominated for this honor were most worthy of representing us as Grand Marshal in the 2017 parade. It is an honor to those individuals to be deemed well deserving and worthy to be considered by others for parade Grand Marshal. 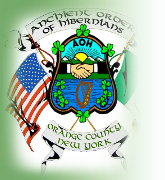 Therese (Terry) Myers, Orange County LAOH President was selected by AOH Orange County to be a 2017 Aide to Grand Marshal Michael J. Dowling in the New York City's St. Patrick's Day Parade. You can view Terry's biography by going to the County website address. Congratulations to Terry! This is a first for AOH Orange County with a member of the LAOH being chosen for this honor. Our own Brother John Blaine has been selected by his brothers to represent AOH Fr. Emmanuel Hourihan Division 4 in the 2017 Mid-Hudson St. Patrick's Day Parade to take place on Sunday, March 12th in Goshen. John received his Aide's Sash along with several other aides from Irish organizations from throughout the county at the Grand Marshal Installation Ceremony held at AOH Joseph Duelk Jr. Division 1's Hibernian Hall on Sunday afternoon December 4th. Once again congratulations to all recipients being honored. Here's some background info' on AOH Division 4's 2017 Aide to the Grand Marshal John Blaine: John was born in Cornwall, NY. He has earned his Major Degree with AOH Division 4 and enjoys learning about Irish history. John is a 40 year member of Highland Engine Co. # 1 in Cornwall and is a former trustee and parade marshal. He retired after teaching Culinary Arts for 30 years at Orange/Ulster BOCES. Four times John received Who's Who among America's Teachers honors. John is a graduate of The Culinary Institute of America. He resides in Goshen, NY with his wife Gail and two daughters Victoria and Madison. The St. Patrick's Day Parade has been held in New York City since 1762. A band of Irish soldiers serving in the British Army started the tradition and were the first to march. This year's parade will salute both Catholic Charities and the New York State Troopers each who are celebrating 100 years of serving New Yorkers in need. The parade evolved over the years as many oppressed and hungry Irish immigrants arrived at our shores during the 1800's. It was here in New York City and throughout the United States where the Irish were able to realize the American Dream. Here they were able to find work, practice their Roman Catholic faith and simply live in peace and dignity. Be sure to check out the Upcoming Events page. Remember to keep in your prayers our deceased Chaplains, Fr. Robert Greco, Fr. Jack Logan and Fr. James Matthias DesLauriers and AOH Division Brothers who have passed away. Brother Dennis Simmons passed away in August. I ask that you say a special prayer for Dennis, his wife Carla and daughter Kimberly. Keep Michaela Cummings (Mike's wife) and Brother Tom Cavanaugh in your prayers. Brother Mike Garay is in Orange Regional for a couple of weeks. Brother Buddy McKernan is on the mend. Keep all our Brothers and their families in your prayers this New Year. See 2016 Summer Upcoming Events Page! Our next meeting will be on Friday, September 9th 7:30 pm at the Dikeman Engine & Hose Company in Goshen. President - Kevin Dooner, Vice-Pres. - Michael Cummings, Financial Secretary - Edmund Burke, Recording Secretary - Thomas B. Quinn, Treasurer - Michael Garay - Chairman, Standing Committee, Conor Gillis, Marshal - Robert Heppes, Sentinel - Ronald Heppes. A Shamrock and Major Degree Ceremony will be conferred at Pearl River HS on June 5th hosted by the AOH of Rockland County. It will begin at 12 noon. Those attending need to contact Brother Ed Burke at 845-342-6176 or ateburke@hvc.rr.com. If you are in need of the degrees, inform me or another AOH Division 4 officer ASAP. We may be able to make car pool arrangements or rent a small bus to deliver you to the location where the Degree ceremonies will be held. Please be sure to bring your active/up to date AOH Division 4 membership card with you.The cost of the ceremony is $20.00. A luncheon will follow at the Division 3 Hall in Pearl River. The next AOH Orange County Board meeting will take place on Sunday, June 12th at Hibernian Hall , AOH Division 1 at 2:00 pm. All members in good standing are invited to attend. Please be sure to bring your up to date membership card. AOH Joseph Duelk Jr. Division 1 is in the process of recruiting Catholic young men ages 8-15 to form an AOH Junior Boy’s Division. AOH Division 1 President Thomas Flynn and Orange County Board President Thomas McDonald have contacted John S. Burke CHS to attract young men attending there to consider joining an AOH Junior Boy's Division. If you have family members or know someone who would be likely and deserving candidates, please have them contact me and I will obtain the pertinent information and put them in contact with Tom Flynn and /or Tom McDonald. The AOH 98th Biennial National Convention will be held in Atlantic City from July 11th to July 14th. Plans are in the works for a bus to transport members for voting purposes to the convention on Thursday, July 14th. The bus will be leaving very early from Division 1's Hall in order to allow us time to vote and to take advantage of the facilities at Harrah's, Voting is between 7:00am and 11:00am. AOH Division 4 will be taking out a journal ad for the convention at Harrah's. This ad will honor the patriots of the Irish Rising of 1916. If you are interested in attending, contact Tom McCarthy at tjm19@mygait.com. (845)783-1641 at home or at (845)800-1561 on his cell. For more information and convention money savings packages on hotel rooms go to http://www.aoh.com/ac2016.Make sure you book before June 1st.The convention convenes at Harrah's Hotel &Casino located at 777 Harrah's Blvd. AOH Division 1 of Monroe will have a scheduled golf outing on June 17th at West Point.. More details can be found by contacting AOH Division1 tjm19@mygait.com. (845)783-1641 at home or at (845)800-1561 on his cell. New York State AOH and Orange County AOH Board News Brother Jim Kelly of AOH Joseph Duelk Jr .Division 1 Monroe is the recipient of the Burns Hayes Award. It was given at the NY State Convention held in East Durham on Saturday, April 30th. Brother Jim Kelly of AOH Joseph Duelk Jr .Division 1 Monroe is the recipient of the Burns Hayes Award. It was given at the NY State Convention held in East Durham on Saturday, April 30th. Congratulations Jim. The award is to memorialize the contributions to Hibernianism in New York State by Past Presidents John M. Burns and James F. Hayes. The New York State Board, Ancient Order of Hibernians in America, shall award biannually, an appropriate award to a resident of the State of New York, living at the time of voting. The Nominee must be someone who espouses the causes and ideals of the Order. This year's Burns-Hayes Award Presentation will take place at the November New York State President's Testimonial Dinner.The award is the highest honor that the NY State Board can bestow.Your Brothers at Fr. Emmanuel Hourihan AOH Division 4 whole heartedly congratualate you on your receiving this award. On Memorial Day, May 30th Brothers from AOH Division 1 and 4 commemorated the sacrifices of our Veterans by participating in Sunrise Services at seven cemetaries in Goshen. Members of the community together with veteran's organizations who organized this event participated.The ceremony began with a piper playing Amazing Grace, a commemorative prayer, a 21 gun salute and ending with the playing of Taps.This was repeated at each location where Veterans were buried and honored. Division 4 Brothers who attended were Ron Heppes, Pat Lahiff, Ray Patterson, Ed Burke, Buddy McKernan. Bobby Byrnes and Tom Mcarthy of Division1 attended along with two other Brothers whose names I can't recall due to my advancing age. Afterwards a breakfast sponsored by the Knights of Columbus of Goshen was offered to all attending at the Senior Citizens Center. Remember to keep in your prayers our deceased Chaplains, Fr. Robert Greco, Fr. Jack Logan and Fr. James Matthias DesLauriers and AOH Division Brothers who have passed away. Also keep Michaela Cummings (Mike's wife) and Brother Tom Cavanaugh in yours prayers. Also keep Brother Keith Reynolds son in your prayers. He was in a very serious car accident last week. He is recovering at Westchester Medical Center. Our prayers are with him and his family for a speedy recovery. Our next meeting will be on Friday, January 7:30pm at the Dikeman Engine & Hose Company in Goshen. President - Kevin Dooner, Vice-Pres. - Michael Cummings, Financial Secretary - Edmund Burke, Recording Secretary - Thomas B. Quinn, Treasurer - Michael Garay - Chairman, Standing Committee Conor Gillis, Marshal - Robert Heppes, Sentinel - Ronald Heppes. Brothers, I wish you and yours a Happy New Year! I survived my trip to family in North Carolina. In the upcoming year I'm certain that by working together as we have in the past, we can achieve what we set out to accomplish. What should we cocert our efforts toward? As I am sure you are all aware the Division 4 needs to continue to focus on the challenge of attracting and recruiting new members during 2016. AOH Division 4’s resolution is to increase membership during the 2016 year. If each Brother took it upon himself to speak with and recruit just one prospective candidate, I’m sure we could get the membership up and perhaps over 50 AOH Division 4 Brothers. I suggest starting with family such as brothers, sons, cousins, in-laws, and friends as well as those in your parish. Just mentioning it or planting a seed could pay benefits with that person thinking about it, and later on down the road joining our organization. Below are some additional suggestions written by NYS AOH organizer Keith Reynolds in the December 2015 issue of the Empire State Hibernian. "Since each jurisdiction is different, and you know your neighborhood better than us, have your Division Organizers reach out to churches, not just after Mass, with a recruiting table. Attend church functions and talk to potential members. Don't just let the Knights be visible in church, be proud and wear your Hibernian shirts and jackets to Mass let your parish members know you're here. Target businesses with Irish names. Brother Tim Myles had a great idea.Target people flying an Irish flag outside their home. Make up a letter on Division letterhead thanking them for being proud to support their Irish heritage and leave contact information on how to join our Order in their mailboxes. Brothers, we need to continually strive to improve our ranks, "New members don't just walk through our doors, we have to actively go out and find them". Division 4 is striving to increase the number of Brothers who have a Shamrock Degree. The AOH expects all its Brothers to eventually earn the Shamrock Degree and the Major Degree. Albany’s AOH Division 5 is offering a Shamrock Degree Ceremony on January 31, 2016 at their Hall. Arrangements could be made to car pool among the Brothers in the Divisions or if there are a good # of candidates get a small bus. In an email I sent out in December there is a list of Brothers who do not have a Shamrock Degree. If your name is on the list we would encourage you to join us on the 31st to get the Shamrock Degree. Please contact me at this email address:kdooner@hvc.rr.com or you can reach me at home 845-342-8892 or cell# 845-741-9644. Mid Hudson St. Patrick's Day Parade Committee Maureen Mulcahy has volunteered to organize the Mid-Hudson St. Patrick's Day Parade Committee's Breakfast held yearly at Kuhls in Middletown, NY. This year it will be on Sunday, March the 13th. Jason Fox, president of the parade committee, has orchestrated the breakfast these past few years. If you are interested in helping out contact Jason at jnfox37@aol.com. He has everything needed to perform this job on his computer, and would share what he has done to make the Breakfast the success it has been in past years. The parade committee is also in need of volunteers to aid with the Line of March the morning of the parade Sunday, March the 13th in Goshen. If you can help out, please contact Kate Maloney at mharp826@aol.com. On another note the parade committee is looking for pictures or newspaper articles or past parade journals showing or describing past parades held as well as the past parade Grand Marshals honored. Please contact Maureen Morse of the Parade Committee at queenmedbhbh@yahoo.com. if you have pictures and/or materials. The Grand Marshal Installation for the 2016 Mid-Hudson St. Patrick's Day Parade took place at AOH Division1's Joseph Duelk Jr. Hibernian Hall in Monroe on Saturday, December 5th. Sister Ann Daly was installed as the 2016 Mid-Hudson St. Patrick's Day Parade Grand Marshal. Along with Sister the Aides to the Grand Marshal received their Aide sashes. Our own Conor Gillis of Division 4 was among those honored. Congratulations to Sister Ann, Conor and all the Aides chosen for the 2016 parade. Sister Ann is well known in the Irish community of Orange County as she has lived and worked in the Goshen area for 52 years. Sister taught at St. John the Evangelist Elementary School in Goshen. In 1963, her first year there, she was my wife Mary's third grade teacher as well as Brother Tom Quinn's teacher. Sister has been Director of Religious Education, Executive Director of Hospice Planning and Coordinator of Spiritual Care. In 1998 Sister Ann was voted Irish Woman of the Year by the Irish Festival Committee. Sister has served as chaplain of LAOH Division since its inception in 2009. Congratulations Sister Ann! Conor Gillis has been chosen by the Fr. Emmanuel Hourihan AOH Division 4 to represent the Division as Aide to the Grand Marshal for the 2016 Mid-Hudson St. Patrick's Day Parade. Congratulations Conor! Conor was born and raised in Orange County. He graduated from East Stroudsburg University with a Degree in Political Science. Most recently he was elected Chairman of the Standing Committee for AOH Division 4. Conor is an aspiring bagpiper. Currently, Conor is employed for New York State Senator John J. Bonacic. Previously Conor worked for Congresswoman Nan Hayworth and Orange County Executive Edward A. Diana. The AOH Orange County Board held its quarterly meeting at the Joseph Duelk Jr. Hibernialn Hall on Sunday, December 6th. NYS AOH President Tim McSweeney and Freedom for All Ireland Chairman, Ciaran Geraghty bestowed upon James Kelly a life time AOH membership award in recognition of Jim's outstanding contributions to the AOH. Jim of Division 1 is a noted historian and piper. He has held many of the officer positions at the division and county level and has worked cooperatively with the state and national in lending his years of experience in furthering Hibernian goals. He has done much to attract members to the AOH and pipers to the county band. Jim has taught many individuals over the years how to play the bagpipes. His pipers escorted Jim into the Hall and in conclusion to the meeting they played a medley of songs in his Jim's honor. Congratulations to you Jim! This is certainly the definition of an honor well deserved. You are the epitome of what it means to be a Hibernian! "Kick Off to St. Patrick's Day" sponsored by the MHSPDPC will be at Kelly Jeans in Goshen, NY Saturday, February 14th. "Irish Day" will be held at the American Legion Arthur Finnegan Post in Greenwood Lake on Sunday, February 28, 2016. Kate Maloney is this year's chair of Irish Day. Remember to keep in your prayers our deceased Chaplains, Fr. Robert Greco, Fr. Jack Logan and Fr. James Matthias DesLauriers and past Division Brothers who have passed away. Also keep Michaela Cummings (Mike's wife) and Brother Tom Cavanaugh in yours prayers. To all the Brothers of Fr. Emmanuel Hourihan AOH Division 4, I wish you and your family a Blessed and Holy Christmas and Happy New Year! President - Kevin Dooner, Vice-Pres. - Michael Cummings, Financial Secretary - Edmund Burke, Recording Secretary - Thomas B. Quinn, Treasurer - Michael Garay - Chairman, Standing Committee Thomas McDonald - (acting/temporary), Marshal - Robert Heppes, Sentinel - Ronald Heppes. Maureen Mulcahy has volunteered to organize the Mid-Hudson St. Patrick's Day Parade Committee's Breakfast held yearly at Kuhls in Middletown.This year it will be on Sunday, March the 13th. Jason Fox, president of the parade committee, has orchestrated the breakfast these past few years. If you are interested in helping out contact Jason at jnfox37@aol.com. He has everything needed to perform this job on his computer, and would share what he has done to make the Breakfast the success it has been in past years. The Grand Marshal Installation for the 2016 Mid-Hudson St. Patrick's Day Parade will take place at AOH Division1's Joseph Duelk Jr. Hibernian Hall in Monroe on Saturday, December 5th at 3 PM. Music will be provided by Gary McComb. Sister Ann Daly has been chosen as the 2016 Mid-Hudson St. Patrick's Day Parade Grand Marshal. Sister is well known in the Irish community of Orange County as she has lived and worked in the Goshen area for 52 years. Sister taught at St. John the Evangelist Elementary school in Goshen. In 1963, her first year there, she was my wife Mary's third grade teacher as well as Brother Tom Quinn's teacher. Sister has been Director of Religious Education, Executive Director of hospice planning and Coordinator of Spiritual Care. In 1998 Sister Ann was voted Irish Woman of the Year by the Irish Festival Committee. Sister has served as chaplain of LAOH Division since its inception in 2009. Congratulations Sister Ann! Orange County Ladies Ancient Order of Hibernians (LAOH) will be hosting a Christmas Dinner (yes it's that time again) at Lemoncello's in Goshen on Thursday, December 3rd and is cordially inviting the men's AOH Divisions of Orange County join them. The cost is $40 per person. Proceeds from the raffle will benefit Safe Homes. If interested contact Terry Myer: 914-443-0362/ Mary Wingenter 845-794-2288/PeggyFlynn 845-446-2327. Thank you to Brothers Ron Heppes, Ed Burke, and new Brother Ed White for their assistance in making the Orange County Communion Mass and Breakfast held on Sunday, October 13 a success. The Mass was celebrated by Fr. Michael at the Sacred Heart Chapel. Thanks also to Division 1’s president George Anderson, Division 2’s president, Bill Kirnan and Keith Reynold NYS State organizer for his assistance with recruiting the guest speaker Ciaran Geraghty NY State Freedom for all Ireland Director. Our next meeting will be on Friday, October 2nd at 7:30pm at the Dikeman Engine & Hose Company in Goshen. Hope you are all well and in good spirits. President - Kevin Dooner, Vice-President - Michael Cummings, Financial Secretary - Edmund Burke, Recording Secretary - Thomas B. Quinn, Treasurer - Michael Garay - Chairman, Standing Committee Thomas McDonald - (acting/temporary), Marshal - Robert Heppes, Sentinel - Ronald Heppes. The Orange County Board held its 17th Biennial County Convention on Saturday, May 16, 2015 Hibernian Hall in Monroe. Congratulations to the newly elected county officers. Our new officers are as follows: President: Tom McDonald, Vice president: Edmund Burke, Recording Secretary: Bill Kirnan, Treasurer: Keith Reynolds, Financial Secretary: Jack Graham, Standing Committee: Ronald Heppes, Marshal: John Greehy, Sentinel: Kevin Dooner. It should be noted that four of those elected (Tom McDonald, Ed Burke, Ronald Heppes and yours truly) are brothers from Division 4. A well-deserved thank you goes to outgoing county officers led by President Kevin Moore for a job well done over the past two years. The new officers were installed by New York State AOH President James Burke. He was assisted by Victor Vogel NYS/AOH Secretary. There were in attendance 42 members from the three county divisions. On Sunday, October 18 the Orange County AOH Board will hold a Communion Mass and Breakfast. The Mass will take place at 9:30am at the Sacred Heart Chapel 151 Stage Road in Monroe just about a block away from Division1's Hibernian Hall. The Division's will gather at 9:15am at the chapel. Parade uniform is appropriate. An Irish breakfast will follow at the hall (approximately 10:30am) catered by Rambler's Rest. Since I am in charge of the breakfast this year as president of Division 4, any assistance from my Division 4 brothers in setting up for the breakfast would be greatly appreciated. The honored guest speaker at the breakfast will be Ciaran Geraghty who is in chairman of NY State's AOH Freedom for All Ireland. Ciaran will speak to the latter topic as well as to activities taking place throughout the 2016 year commemorating the 100th anniversary of 1916 Uprising in Ireland. We would love to have you join us. The cost is $10 per person over the age of 8 payable at the door. The 2015 NY State AOH/LAOH Biennial Convention held at the Long Island Marriott in Uniondale, NY 11553 on Wednesday, July 8th through Saturday, July 11th. The new elected NYS AOH President is Timothy McSweeney. Vic Vogel is the new AOH Vice President. State Secretary is Thomas Lambert, Treasurer, John J. Manning, State Chaplain Fr. Henry W. Reid, Veteran's Affairs Jack Ryan, Organizer Keith Reynolds, Webmasters Kevin Cummings and Kevin Ellis, and Freedom for All Ireland, Ciaran Geraghty. The new AOH District 8 Director for our region of the state is Dermot Moore from Rockland County. He takes over from Keith Reynolds. Thanks Keith for a job well done. Under Keith's watch Sullivan County has added a new AOH Division. Past AOH Division4 Chaplain Fr. James Matthias DesLauriers O.Carm passed away at 80 years of age on September 9th in Melbourne, Australia surrounded by his family. Known as Fr. Matt by all, he was a past Grand Marshal for the Mid-Hudson St. Patrick's Day Parade. He was well known in the Middletown area for his graciousness, kindness and dedication. A memorial mass will be held at the National Shrine of Our Lady of Mount Carmel celebrating his life on Saturday, October 10th at 11:00am. The Mass will be followed by a luncheon in Pilgrim Hall. On another sad note, Mrs. Catherine Quinn, mother of Brother Thomas B.Quinn, passed away Tuesday, September 29th after a short illness. I knew Aunt Kay well(my wife Mary's aunt). She was the widow of Thomas E. Quinn and the mother of 4 children Kathleen, Regina Decker, Maureen and Thomas. She had two granddaughters Christine O'Connor and Maureen Black and three great granddaughters Erin, Katy and Maddie as well as numerous nieces and nephews. Kay had a great sense of humor, laugh and smile and thoroughly enjoyed her family and friends. All were welcomed at her door. She was devoted to her church St. John the Evangelist, the Altar Rosary Society, the LAOH, and to the Goshen community. She delivered Meals on Wheels with her deceased sister Lillian into her 80's.The wake will be held Sunday 10/4 at Donovan's Funeral Home in Goshen. The funeral Mass will be held on Monday, 10/5, 10am at St. John the Evangelist Church, Murray Ave. Goshen, New York. Remember to keep in your prayers our deceased Chaplains, Fr. Robert Greco, Fr. Jack Logan and Michaela Cummings (Mike's wife) and Tom Cavanaugh and those mentioned above who have recently passed away. Our next meeting will be on Friday, September 11th at 7:30pm at the Dikeman Engine & Hose Company in Goshen. Hope you are all well and in good spirits. It should be noted that four of those elected (Tom McDonald, Ed Burke, Ronald Heppes and yours truly) are brothers from Division 4. A well-deserved thank you goes to outgoing county officers led by President Kevin Moore for a job well done over the past two years. The new officers were installed by New York State AOH President James Burke. He was assisted by Victor Vogel NYS/AOH Secretary. There were in attendance 42 members from the three county divisions. AOH Division 4 will be holding the 2015 Patrick Cochrane Golf Tournament on Friday, August 7, at the Monroe Country Club. This is our 15th year holding this event. More information will be found on the Upcoming Events page. This is Division 4's primary fundraiser for the year and we need the full support of the brothers. This means essentially recruiting fellow brothers, family, friends and neighbors to join us that day. Any business willing to sponsor the event with a TEE sponsor would also be welcomed. Tee sponsors can also be in memory of family and friends who have passed away. There will be plenty of food, laughs and camaraderie to go around as was evident in years past. Pat Cochrane was a brother who was actively engaged in all division events. Pat had a great sense of humor and was fun to be around. He is sorely missed. Pat passed away due to cancer and this tournament is named in his honor. At the Division's May meeting Brother Edmund Burke brought to the membership's attention the efforts of a Father Kiely on behalf of Christians being persecuted in Iraq and Syria. Ed spoke how Fr. Kiely had spoken to his parishioners about what was happening to Christians in the Middle East, and how after Mass a parishioner called him on what was he doing exactly to help these Christians. Fr. Kiely came up with Nazarene bracelets to raise funds and awareness of the atrocities and persecutions. Below is a more detailed description of what is occurring and what you could do if you so choose. Thank you, Ed for bringing this to the Division's attention. Proceeds to Catholic organization, Aid to the Church in Need, to help suffering Christians in the region. Memorial Day Monday, May 25th several brothers from the division and county participated in honoring our deceased veterans in Goshen. There was be a morning sunrise service that started at 6:45AMat St. John’s Cemetery followed by memorial visits to St. James Cemetery, Slate Hill Cemetery, Orange County Veterans National Cemetery then the Orange Blossom Monument. Breakfast was served following this memorial service. It was hosted by the Fourth Degree, St. John’s Knights of Columbus at the Senior Center. All who take part in the services are invited. Division 4 has supported this memorial service in past years and encouraged those from the other divisions to join us. It was a moving ceremony and the turnout and weather were very good. Welcome to our newest member Ed White. Ed resides in New Hampton. I worked many years with Ed when he was a vocational education instructor at Mid Orange Correctional Facility in Warwick. He is originally from Dublin, Ireland. When you meet Ed, please be sure to welcome him to the Division. He comes from a family of coopers in Ireland. I believe that means barrel makers. Remember to keep in your prayers our deceased Chaplains, Fr. Robert Greco, Fr. Jack Logan and Michaela Cummings (Mike's wife) and Tom Cavanaugh. Mary Comiskey, widow of Brother Seamus Comiskey has just recently passed away as has Brother James Corcoran of Division 1. Keep them in your prayers. Our next meeting will be on Friday, May 1st at 7:30pm at the Dikeman Engine & Hose Company in Goshen. Hope you are all well and in good spirits. It should be noted that three of those nominated for county office are brothers from Division 4. Good luck guys! Our next meeting will be on Friday, March 6th at 7:30pm at the Dikeman Engine & Hose Company in Goshen. Hope you are all well and in good spirits. Brother Dennis Simmons has been selected as Division 4's 2015 Aide to the Grand Marshal for the Mid-Hudson St. Patrick's Day Parade. Congratulations Dennis! You are well deserving of this honor. Dennis has always been supportive and active in Division and County events. Dennis was born in and is a lifelong resident of Port Jervis, NY. He is the son of David C. Simmons Jr. and Kathryn E. Monahan Simmons. He has three bothers David, Daniel and Timothy. Dennis has been married to his wife, Carla Irwin for over 39 years. They have one daughter, Kimberly and two grandchildren, Ashley and Erick. Dennis is retired with 24 years’ service as Senior Master Sergeant from the USAF National Guard. He is also retired from NY Correctional Services after 32 years as Senior Correctional Counselor. He is a parishioner and Eucharistic Minister at the Immaculate Conception Church of Port Jervis. Dennis is also a member of the Port Jervis Knights of Columbus. Presently, Dennis is the Orange County Legislator for the 13th District. Previously he has served on the Port Jervis Common Council and is a member of many civic, community and veterans organizations. President - Kevin Dooner, Vice-President - Michael Cummings, Financial Secretary - Edmund Burke, Recording Secretary - Thomas B. Quinn, Treasurer - Michael Garay - Chairman, Standing Committee Thomas McDonald - (acting/temporary), Marshal - Robert Heppes, Sentinel – Ronald Heppes. The Mid-Hudson St. Patrick's Day Parade Committee has selected Ann Michel as this year's (2015) Grand Marshal. Congratulations Ann! Ann Michel has been a long standing and active member and officer in LAOH St. Therese Division 4. I've known Ann for close to 40 years. I first met her when she typed my Master thesis for me many years ago. Her late husband was Bob Michel a member and past president of AOH Division 3 in Warwick. Bob was my mentor at my first administrative job and as a result I got to know Ann and her family. Ann has always been a strong advocate for the Irish community here in Orange County. Enjoy your year as Grand Marshal. Ann's bio may be found at http://www.mhspp.org . Click Grand Marshal. Congratulations to Orange County President Kevin Moore who has been selected by the Orange County AOH and LAOH to be an Aide to the Grand Marshal in the 2015 St. Patrick’s New York City Parade. To see Kevin's Bio go to http://www.mhspp.org and click Orange County Aide. Sunday, February 22 Kevin and the other Aides to the NYC Parade Grand Marshal Cardinal Timothy Dolan at Antun's in Queens Village. It was a great afternoon honoring the aforementioned Irish Americans. Sister Peggy Murphy who many of you are familiar with through her active involvement with Irish organizations in the county over many years has been selected by the Irish Voice to the top 100 Irish Educators. Sister Peggy is a Dominican Sister who teaches Religious Studies at Mount St. Mary's College in Newburgh. Sister is known for her beautiful rendition of Our Lady of Knock which she has sung at Masses and county events held by the various Irish organizations. Congratulations to you Sister! Make sure you visit the Upcoming Events on the Division 4 website (this website) to see what's going on in Orange County Irish community for 2015. The Mid-Hudson St. Patrick's Day Parade will take place on Sunday, March 15 at 2 pm. Lineup is no later than 1:30 pm. Hope you can make it! We will need Brothers to carry the Division's Banner and flags. The New York City Parade will be held on Tuesday, March 17th. Contact Tom McCarthy of AOH Division 1 if you want to reserve a seat on the bus leaving from Monroe. Cost is $30.00 per person. His e-mail address is TMccarthy@AOHDivision1.org. See you at the parades! Remember to keep in your prayers our deceased Chaplains, Fr. Robert Greco, Fr. Jack Logan and Michaela Cummings (Mike's wife) and Tom Cavanaugh. Tom was in Orange Regional in mid - December with some health issues with his heart. Mike Shannon, past President of Division 2, is experiencing some health problems. Please keep Brother Shannon in your prayers. Our next meeting will be on Friday, September 5th at 7:30pm at the Dikeman Engine & Hose Company in Goshen. The next meeting of the Orange County Board will be held at 2pm on Sunday, September 7th, 2014 at Joseph Duelk Jr. Division 1 in Monroe. As Division President, I have been urged to invite Division 4 members to attend this important meeting. The AOH Division 4 2014 Patrick Cochrane Memorial Golf Tournament was held on Friday, July 11th at the Monroe-Woodbury Country Club. Thanks go out to division 4 brothers John Higgins who chaired the event working closely with the Monroe Country Club, Ron Heppes who solicited the Tee sponsors, Tom McDonald who created the Tee sponsor signs on his computer, Ed Burke who brought the beverages, bags, shirts and whatever else he had stored in his basement. Brother Mike Garay and Brother Gene Burns helped us out that day also. John Higgins got us the great hats commemorating the event. I hope I didn't leave anyone out who deserves to be recognized for their efforts on behalf of the Division. The Our Lady of Knock Mass was celebrated at the National Shrine on Sunday, August 17th. It was followed by a breakfast at the Soho Restaurant, Crystal Run Crossing in Middletown. Our own Division 4 Chaplain Fr. Bob Greco was the principal celebrant. His words were both fitting and moving in talking about his Irish connection with the Carmelites over the years. Father and a good number of the attendees attended the breakfast at the SoHo restaurant after the Mass. Many thanks go out to Ann Michel of the LAOH and our own Ron Heppes for their efforts in planning for the Mass and breakfast. New York State LAOH President attended the Mass and breakfast. The AOH Orange County Picnic will be held at the Fr. Donald J. Whelan Division 2 Hall in Cornwall on Saturday, September 13th. I attended last year's picnic and it definitely was a fun event for all! The Committee chairmen of this year's event will be Division1's President George Anderson, Division 2's president Mike Shannon and Division 4's Kevin Dooner. This is a great opportunity to connect with our brothers in Division s 1 and 2. We are looking for division members to help out with setting up the tables and chairs, help out at the grills and collect at the front door. Let me know if you can be there to help out. The cost is $10 per person, $25 per family. The picnic starts at 12 noon. There will be music and Division 1's Mike Tully Pipe band will play. Remember to keep in your prayers Michaela Cummings (Mike's wife) who is undergoing radiation treatment. Unfortunately, I have some sad news to report. John Brophy Jr. of Division 1 who was undergoing radiation treatments for cancer passed away over the summer. His Dad John Brophy was Orange County's 2014 NYC Aide to the Grand Marshal. Our condolences and prayers go out to John and his family and friends. I hope you and yours have had a restful and pleasant summer with family and friends. Division meetings will resume on First Friday, September 5th. Last, but not least, 2014 dues and arrears are payable to the Division and are being collected by our Financial Secretary, Ed Burke. They can be either brought to the meeting this Friday or send to the Division Post Office Box 436, New Hampton, NY 10958. Keep in your prayers Michaela Cummings (Mike's wife) who is undergoing radiation treatment and John Brophy's son.